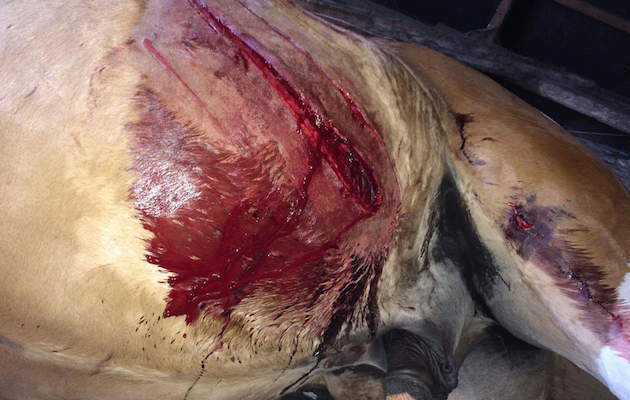 The owner of a horse who was hit by a car after he was spooked by a pack of dogs wants to raise awareness of two issues important to riders. Pauline Watson fell from her five-year-old Jack when the five large dogs burst through an open gate near her livery yard in Durham at the end of May. The coloured gelding ran loose along the road, straight into the path of an oncoming car. Pauline, who was not badly hurt, does not yet know the extent of Jack’s injuries but she wants to warn others about the issues involved. “It’s a lesson on the importance of having public liability insurance,” she told H&H. “Luckily, I’ve got it through my British Dressage membership but if I hadn’t, I’d have had to re-mortgage my house to cover the costs. Pauline’s insurance will cover the cost of the car, which was written off in the collision and for which as Jack’s owner she is liable, and any claim the driver may make for injuries. Jack also damaged the lorry a friend of Pauline’s brought to the rescue and the cover will pay for a new ramp. Jack suffered serious lacerations, which are now healing, although further investigation is needed to determine whether he also sustained long-term career-limiting injuries. Warning, very graphic image. But no one was seriously hurt, leading Pauline to describe herself and Jack as “unlucky – but so lucky”. “The car’s bonnet went under Jack’s belly and he flipped up and hit the wall of a house; he was knocked out,” she said. “The road’s a 60mph limit and although most people aren’t that stupid, there are some. But this young girl was only doing about 30mph. “That road’s regularly used by groups of cyclists; if he’d run into 10 of them, he could have killed five people. “I’m 46 and been around horses since I was three, and nothing like this has ever happened, to me or anyone I know but there’s just the potential, what could have happened. Pauline also wants to raise awareness of the harm dogs can cause, as those involved in her accident were able to approach Jack as the gate was open.